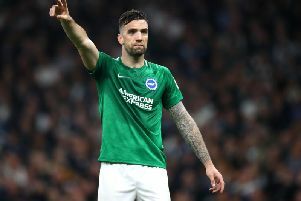 Brighton & Hove Albion secured a precious point in their battle for Premier League survival by holding Tottenham Hotspur to an end-to-end 1-1 draw at the Amex this evening. Pascal Gross' 49th-minute penalty proved enough for a point as it leveled up Harry Kane's opening goal just two minutes into the second half. With the Seagulls' tricky run in, against five teams all in the top seven, fears were growing that they could be sucked into the relegation battle even more. And considering that three of their four home defeats this season have been against teams in the top six, supporters would have been forgiven for some pre-match nerves. But it was an accomplished performance by the hosts, especially defensively to shut out the well-lauded attacking play of Tottenham, albeit they made six changes with one eye on Saturday's FA Cup semi-final. Nevertheless, a point was a brilliant night's work for the hosts and extremely well deserved. It lifts them to a total of 36 points, eight clear of the bottom three in 13th place. Chris Hughton, facing a side he previously managed and made 400 appearances for, made two changes to his side that lost at Crystal Palace at the weekend. In came Spanish defender Bruno to captain the side while winger Anthony Knockaert was also recalled. Dropping out of the team were forward Jurgen Locadia and defender Ezequiel Schelotto. Mauricio Pochettino kept to his word of making changes as there were six from the starting XI that lost 3-1 to Manchester City at Wembley on Saturday. Toby Alderweireld returned for a first league start since October, while Serge Aurier, Viktor Wanyama, Moussa Sissoko, Lucas Moura and Heung-Min Son all came into the line-up. Dele Alli was not included in the match-day squad presumably with one eye on Saturday's FA Cup semi-final with Manchester United. Dropping out of the team were Davinson Sanchez, Kieran Trippier, Erik Lamela, Eric Dier and Mousa Dembele. Lewis Dunk received the first yellow card of the match after chopping down Moura on the edge of the box, but Christian Eriksen's effort from 19 yards was straight into the wall. The first real chance went Albion's way as a Dunk header from a Pascal Gross corner was collected by Hugo Lloris, with Knockaert inches away from getting a toe on it before the goalkeeper. The French winger then drove forwards and his shot took massive deflection, but it was still collected by Lloris. Spurs' first effort came from a Sissoko ball across to Son on the left and he jinxed in the box, but Maty Ryan saved comfortably at the near post. On 27 minutes, a lovely turn by Gross down the right saw him find a yard of space and his cross picked out Dale Stephens whose flick towards goal was blocked and then gathered by Lloris. Five minutes later, a Moura shot from distance was tipped away by Ryan, but the corner was easily cleared. The home side started to get on top towards the end of the first half and a Kane free kick was blocked away, while Ryan also produced a fine diving save to deny Son deep in first-half added time. Spurs led within just two second half minutes as Gross played a horrible back-pass to Gaetan Bong, but Aurier picked his pocket and it fell to Son. The forward shook off Dunk and tried to take it round Ryan, but the ball broke to Kane, who smashed home as the ball clattered off Bruno. But Albion were level just three minutes later as Izquierdo was brought down by Aurier and referee Kevin Friend pointed straight to the spot. Gross stepped up ahead of Murray to take the stop kick and hit it low into the bottom-left corner past Lloris, who did get a hand to it. A tense period played out after the leveler. There was plenty of competitive action, but neither side found space or final ball in the last third. On 70 minutes, a drilled Eriksen effort was deflected just far of the back post and behind and from the resulting corner, Alderweireld fired into the side netting. With three minutes left, substitute Erik Lamela skipped at the Albion defence but fired straight at Ryan. At the other end, a couple of corners in quick succession raised the home crowd, but both were well defended. Albion: Ryan; Bruno, Dunk, Duffy, Bong; Knockaert, Stephens, Kayal, Izquierdo (March 77); Gross; Murray (Ulloa 74). Unused subs: Baldock, Goldson, Schelotto, Locadia, Krul. Spurs: Lloris, Aurier, Alderweireld, Vertonghen, Davies, Wanyama, Sissoko (Dembele 74), Eriksen, Lucas (Lamela 74), Son, Kane (Llorente 85). Unused subs: Trippier, Foyth, Dier, Vorm.